The biggest sporting event in Cebu is happening next weekend. Over two thousand athletes will swim, pedal and run when the fourth edition of the Cobra Energy Drink Ironman 70.3 race starts at 6:27 a.m. on August 2, 2015. 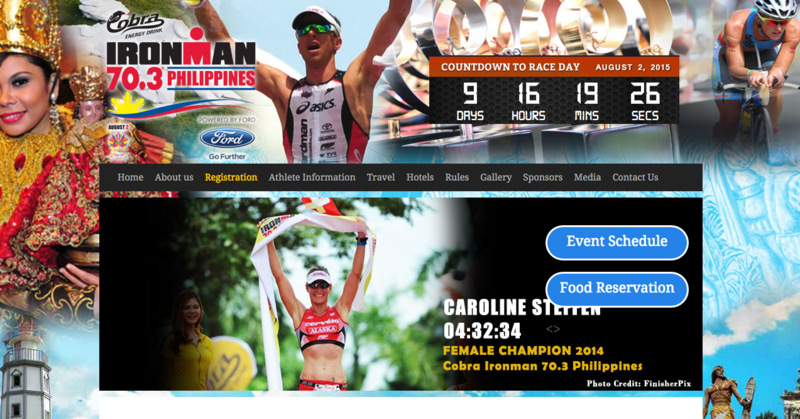 In all, this is the seventh time that Sunrise Events, Inc. has brought the IM 70.3 race to the Philippines. The first three years were held in Camarines Sur (or CamSur). After the venue had become too small to accommodate hundreds more who wanted to join, the event traveled south and landed in the Queen City of the South. That’s Cebu. The swim will start the event on the white sand beach front of Shangri-La Resort in Mactan. After the 1.9 kilometer free-style strokes, the triathletes mount their bikes at the Megaworld-owned property beside Shangri-La. They exit the Mactan Newtown (Megaworld) mega-project then bike towards the Marcelo Fernan Bridge. While up there, the view of the waters down below and the Busay mountains straight ahead will be terrific. The cycling portion is 90 kilometers in distance. It will require the participants to enter the South Road Properties (SRP) Tunnel and will lead them all the way to Talisay City. An “M” loop will ensue, bringing back the cyclists to the Parkmall U-turn area before going back to Talisay. After that second loop, it’s back to the Mactan Bridge then back to Shangri-La. That’s not all. After hours of swimming and biking, it’s on the asphalted pavement of Punta Engaño for the final stage: a half-marathon. That’s 21,000 meters of running, walking, pouring cold water over one’s overheated body. Until finally, finally, the finish at Shangri-La. To all the visitors and participants, enjoy Cebu and enjoy the race. Indeed the Ironman event that were transferred in Cebu really a success and is also a big help in the tourism industry.